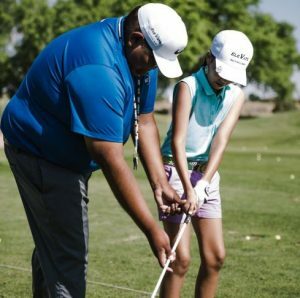 Golf is a club-and-ball sport in which players use various clubs to hit balls into a series of holes on a course in as few strokes as http://flevy.com/blog/wp-content/uploads/2019/03/5-Leadership-Practices-of-CDR-150x150.jpg 150w, http://flevy.com/blog/wp-content/uploads/2019/03/5-Leadership-Practices-of-CDR.jpg 489w" sizes="(max-width: 249px) 100vw, 249px">possible. The more we play golf, the more we realize that there is a negative correlation between how hard we swung and how far we hit the ball. In golf, rarely is much accomplished from merely swinging hard. Sheer force does create action, but this is often negated by a lack of strategy. Life in golf, we need to learn to pull back a little, focus, and work on specific objectives. Almost every business today faces major strategic challenges. In a survey conducted by Strategy&, PwC’s strategy consulting business, the majority of the respondents think that they do not have a winning strategy. In another survey, the majority concedes that they are missing out on major opportunities in the market. These are happening not only due to external forces. These are the outcome of the way most companies are managed. There is a significant and unnecessary gap between Strategy Development and Strategy Execution. There is a lack of connection between where the enterprise aims to go and what it can accomplish. Conventional Management today does not work. It violates the tenets of Management. Most conventional management practices have developed through trial and error. And often, these do not have any direct link to the company’s strategy. It is essential that our company must move away from the conventional wisdom of mainstream business practices to achieve success. It is about time that we focus on Capabilities-Driven Strategy. A Capabilities-Driven Strategy is built on distinctive capabilities that enable companies to focus on their greatest strengths and gain a competitive advantage. The 5 Leadership Practices of Capabilities-Driven Strategy is an appealing path that feels intrinsically rewarding. While this path may not be the only path to success, it is the only path that provides long-term sustainable success. Even taking a few steps in this direction can already boost our company’s energy and morale. Build a Clear Identity. Our identity must be clear even if we offer a wide variety of products and services in multiple sectors. Focus on a Few Capabilities. Capabilities become more significant when these are woven together to produce some unique for our company. Develop a Solid Culture. Culture is the greatest asset of our company. Our culture can either reinforce or undermine our strategy. Manage our Costs. Every cost is an investment. It can either be used to fund powerful, distinctive capabilities or incoherent activities that can hold back companies. Shape our Future. We need to build on early success to save our future. When we do this, our capabilities can give our company opportunities to expand in this global business environment. These Leadership practices are so interconnected that we need to adopt them all together. Overlooking any one of them will cause us to fall back. What will happen if we fail to build a solid culture? When this happens, it will make our people feel trapped and disengaged. New strategies may fail because people do not believe that they will last. Every step is important for every step is a link towards achieving long-term sustainable success. Interested in gaining more understanding of 5 Leadership Practices of Capabilities-Driven Strategy (CDR)? 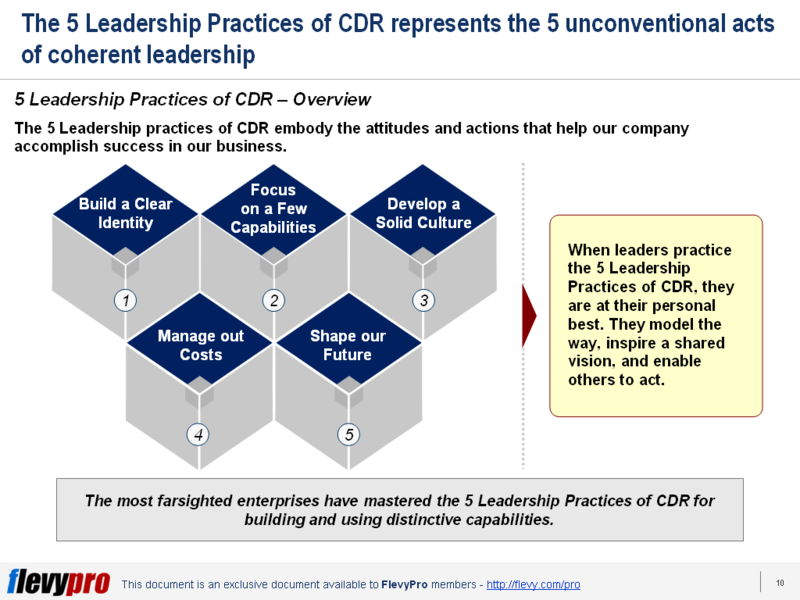 You can learn more and download an editable PowerPoint about 5 Leadership Practices of Capabilities-Driven Strategy (CDR) here on the Flevy documents marketplace.